The British Embassy in Korea marked the 92nd birthday of Queen Elizabeth at the ambassador’s residence in Seoul on Thursday, where hundreds of guests took part in celebrating her long reign. Dignitaries, including politicians, diplomats, business executives, public service workers, scholars, cultural figures and journalists, participated in the event that started at sunset. “The Commonwealth has always been an institution of special importance to the Queen,” said the diplomatic mission, which established formal diplomatic relations with the Republic of Korea in 1949. Diplomatic ties between the two countries go back to 1883. The queen made a well-received state visit to Korea in 1999, a turbulent period for the country in the midst of the Asian Financial Crisis in the late 1990s. This year, the queen played a full and active part in the biennial Commonwealth Heads of Government Meeting in London from April 16-20, which saw the centennial anniversary of the law that allowed women in the United Kingdom to vote, the embassy said. The participating 53 heads of countries made a pledge to create a fairer future, putting a special emphasis on gender equality and inclusion. 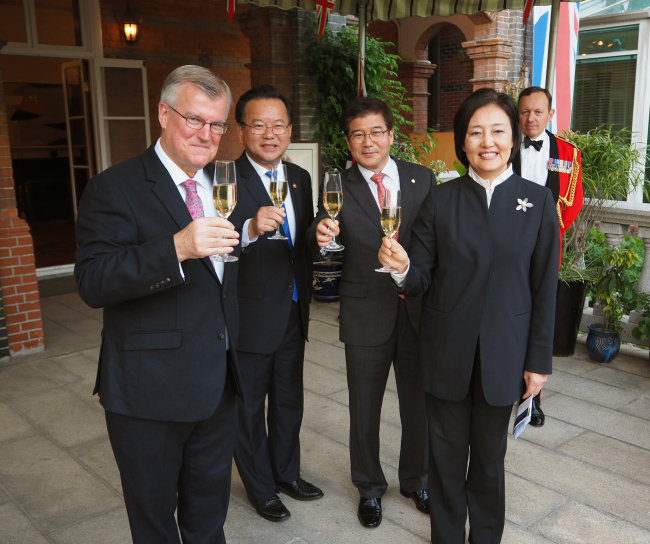 Although the queen’s birthday falls on April 21, the embassy said that the annual celebration in Korea generally takes place a few weeks later -- under slightly better weather conditions. This year’s celebration has also been highlighted by the marriage between Prince Harry and Meghan Markle, now the duke and duchess of Sussex, on May 19.